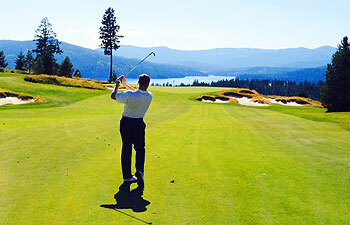 Set on an elevated, forested peninsula that juts into the eastern flank of Lake Coeur d’Alene, Gozzer Ranch Golf and Lake Club is spectacular. Designed by Tom Fazio against a distant mountain canvas, Gozzer Ranch opened for play in 2007 with its trademark shaggy bunkers and black rock outcroppings. This is undoubtedly one of Fazio’s best modern creations that will give Shadow Creek a run for its money. Two driveable par fours, a plunging par three and another one shotter that was blasted through rocks, tough, long and scenic par fours coupled with short and long par fives make Gozzer Ranch one of those courses that you simply want to play over and over again. It’s a veritable cracker. 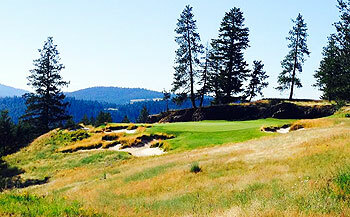 Having had little knowledge of the club or course prior to visiting, we entered the isolated property looking forward to a highly regarded Tom Fazio layout overlooking the beautiful Lake Coeur D’Alene. Even after the first hole, my playing partner and I looked at each other in disbelief, and this feeling of incredulity lasted for the entire round. It is far and away the best Tom Fazio track I have ever played. It doesn't look like a Fazio, feel like a Fazio, or play like a Fazio. Without question or debate, Gozzer Ranch looked, felt, and played so much like a Coore & Crenshaw with its ragged edges to bunkering, wonderful use of fescue, holes perfectly placed on the land and fitting together beautifully. On a Fazio layout, you expect to see white sand bunkers with perfectly sharp edges or courses with multi-million dollar budgets. The front nine is very good, but the back nine is nothing short of superb. On the front side, I enjoyed the downhill par 3 3rd hole, which is followed by a thought-provoking 275 yard par 4 that dog-legs right. All of the green-sites at Gozzer are framed so effortlessly, either by view of the lake or dense forest. The course definitely grows on you through the round while you try to convince yourself that Ben Crenshaw didn’t sneak in after dark and cut out a few bunkers with his shovel before the sun came up again. As with Black Rock, the location has wonderful views of the lake and surrounding areas, but a much more natural feeling to the layout. Highlights for me included the approach shot to the 11th hole that offers an infinity green-complex rolling off into the horizon, and the breath-taking 15th hole that catches you by surprise. From the 15th tee, you really just avoid the bunkers but don’t realise what you’re about to witness. As you proceed down the fairway and enter the dog-leg, you instantly behold a green that is surrounded by the lake and mountains in the backdrop. The routing of this course just makes you thirsty to drink up the excitement that’s pouring at you. It’s nothing short of jaw-dropping on the back nine. Despite an unusual start to the experience, we left the club gasping for more.